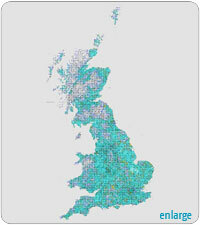 The PageOne paging network delivers 98% population coverage across the UK including Northern Ireland. We were the first UK operator to introduce satellite technology to improve network synchronisation and reliability, using both POCSAG and FLEX™ paging protocols, and the first European operator to launch a national network based on FLEX™ technology to deliver improved capacity and new services. We are the only UK network to have upgraded our infrastructure to remove obsolete switching equipment. Based on high-specification server technology in a high redundancy environment, the PageOne Pager platform ensures the highest levels of service and is able to stay up to date with the latest developments in communications services. Our services are powered by Oventus – a powerful and secure integrated messaging gateway developed by PageOne that supports and enhances GSM & Paging messaging services.